An ancient drama revolving around grief, revenge and daddy issues is never going to be a barrel of laughs. The Old Vic’s Electra has far more gravity than levity and, with Kristin Scott Thomas at the centre, is a masterful character study of one of the Greek pantheon’s most famous anti-heroines. Scott Thomas plays the eponymous daughter of King Agamemnon who, after returning from the Trojan War, is betrayed by his wife and killed by her lover. When we first see her, Electra spends her days mourning her lost parent and plotting the downfall of those she holds responsible. The play is unashamedly a star vehicle for Scott Thomas. Her commanding performance as the barefoot bulldog unable to let go of her internal anguish is a joy to watch. The three-woman chorus who constantly urge Electra to check herself before she wrecks herself are largely indistinguishable but Diana Quick (Brideshead Revisited) as unrepentant mother Clytemnestra and Liz White (Life On Mars) as Electra’s sister Chrysothemis both provide standout performances. The staging is set in the round with a basic set and costume design complemented by sharp lighting and sharper lines. Based on the original story written about 2,500 years ago, Frank McGuiness’ adaptation updates the source text to English but retains many of the original’s zingers (“If you do [it], you’ll be eaten without salt!”). The sparse atmospheric music has been written especially for Electra by Mercury Prize-winning singer/songwriter PJ Harvey. The age difference between the fifty-something Scott Thomas and the twenty-something Jack Lowell (who plays her brother Orestes) has been unfairly remarked upon by the critics at the Telegraph and the Daily Mail. When Zoe Wanamaker took on this role in 1998, she was only about five years younger than Scott Thomas is now. If it is acceptable in the interests of telling a story to have a female Hamlet and a black Iago, this kind of age gap is all part and parcel of the suspension of disbelief required to enjoy any work of theatre. Performers are there to portray characters, not themselves, and should be measured on that score and that score alone. Scott Thomas undoubtedly elevates Electra. But this isn’t a play without its faults — not least the sightlines when attention is drawn to a character on the floor — but the lead actress empowers this production with a palpable commitment to the persona, embedding the emotional turmoil of the sorrow-soaked princess deep within each of her scenes. 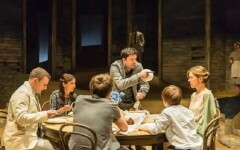 Director Ian Rickson imbues the play with quickfire pacing and heart-wrenching pauses. This ensures that during its running time of six thousand seconds, nary a single one of them is wasted. Electra continues at the Old Vic until 20 December. More information can be found here.